Philippine Sen. Antonio Trillanes talks to reporters outside his office in Manila, Sept. 10, 2018. The Philippine military chief called Monday on all its members to remain neutral following a standoff between opposition Sen. Antonio Trillanes and President Rodrigo Duterte, who wants the former Navy officer jailed after he revoked his amnesty for participating in past rebellions. On Monday, leaders of the 130,000-strong armed forces (AFP) and the defense establishment took steps to quell restiveness in the ranks, saying the military “yields to the wisdom” of the high court regarding Trillanes. However, he warned those “sowing intrigues and discord” that the military would go after them, and that they would not succeed. Last week, Duterte was forced to back down from his Presidential Proclamation 572, which contained a revocation order and ordered the police and military to arrest Trillanes his role in mutinies that occurred in 2003 and 2007. The president claimed that Trillanes, who has criticized his administration’s bloody drug war, did not go through proper military channels to obtain his amnesty. But the senator later released copies of his amnesty papers and asked the Supreme Court to issue an injunction. 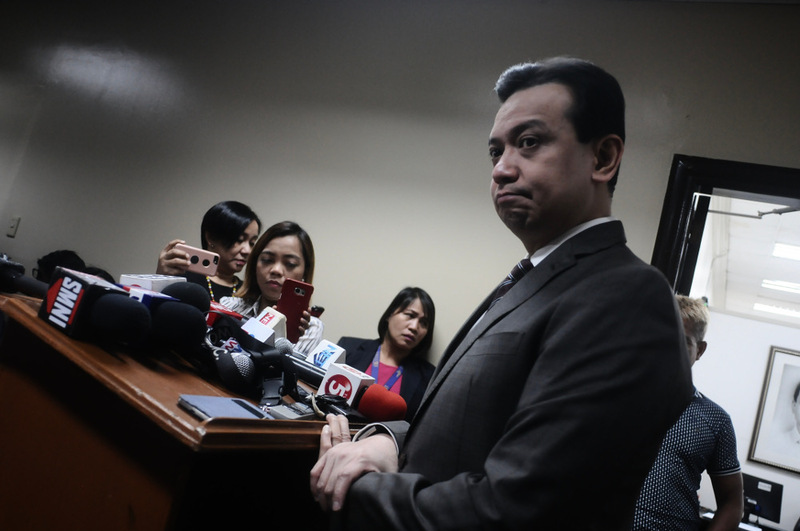 Trillanes held out at the Senate building last week and warned that Duterte was abusing his power. On Friday, the president appeared to back down from the arrest threat, after top security officials prevailed on him to wait for the court’s ruling. On Monday, Defense Secretary Delfin Lorenzana said that the government’s solicitor general, Jose Calida, had called him last month to look into Trillanes’ amnesty records. This went against an earlier claim by Duterte’s spokesman that his lawyers had been building up a case on Trillanes during the past two years. “He asked me personally by phone to get his (Trillanes’) amnesty records at the Department of Defense and the AFP. So I provided him,” the documents, Lorenzana told reporters. Calida made the request in mid-August, the defense secretary said, adding that Duterte did not consult him about the revocation of Trillanes’ amnesty. Meanwhile, the Integrated Bar of the Philippines (IBP), the country’s largest lawyers’ group, expressed alarm at Duterte’s “overt audacity to publicly arrest” a sitting member of the Senate even without a warrant issued by the court. In a statement, the group said Duterte’s order was void from the start, because granting an amnesty was absolute and could not be overturned by presidential powers. “The IBP views with deep concern the position being peddled to the public that records of the executive branch can be used to overturn final dismissal of criminal cases by our courts,” the IBP said. “Arresting and incarcerating Senator Trillanes for offenses dismissed by amnesty runs roughshod over the constitutional guarantee against double jeopardy that no person shall be held to answer twice for the same criminal offences,” it said. In 2003, then-Lt. Trillanes along with about 300 junior military officers, led the takeover of a luxury hotel in Manila’s Makati financial district. They undertook the action as a complaint about corruption within the armed forces, but swiftly surrendered when the president vowed to look into their allegations. Four years later, while being tried for his role in the rebellion, Trillanes and other accused military officers walked out of court and occupied another hotel. They called for then-President’s Gloria Macapagal Arroyo’s resignation, but the rebellion quickly ended when the military rammed an armored personnel carrier into the lobby. Returning home Saturday from a shortened trip to Jordan, Duterte insisted that his order was legal, but said he would abide by the advice of his military and defense officials and wait for the high court’s ruling. He also accused the “yellows, liberals, Trillanes and the Politburo” of working to oust him. “It will go into high gear in October,” he warned. Duterte was referring to the political opposition led by ex-President Benigno Aquino, whose party is associated with the color yellow. He was the one who had granted Trillanes amnesty. Duterte claimed that Trillanes was talking to the leaders of the communist insurgents, though he never explained how and why a former military officer would want to associate with enemies of the state that the armed forces was trained to defeat. When asked to explain what the president meant by those comments, his spokesman, Harry Roque, said the president had access to “all kinds of information.” He noted that the opposition had called on the president to step down while the decades-old communist insurgency was seeking to topple the government. “This is the context of the president’s remarks after his arrival statement when he mentioned the yellow, the liberals, Trillanes and Politburo,” Roque told BenarNews. Felipe Villamor in Manila and Jeoffrey Maitem in Cotabato City, Philippines contributed to this report.